We were excited to have a break from this rough Michigan winter, giving us an opportunity to test our car and see some of our hard work this winter pay off. We are looking forward to an exciting spring testing our vehicle, and racing at the Solar Car Challenge this summer. We would like announce we officially submitted our registration fee and submitted our registration document. We would like to thank, AVL for donating an additional $2,000 dollars to our car, helping us pay for important spare parts and our registration fee. We have had an extremely busy summer and our super excited on the progress of our car. June was a little bit of a wash for the SRC because of final exams and the start of summer. However, the break was a good refresh after a disappointing end to last year. 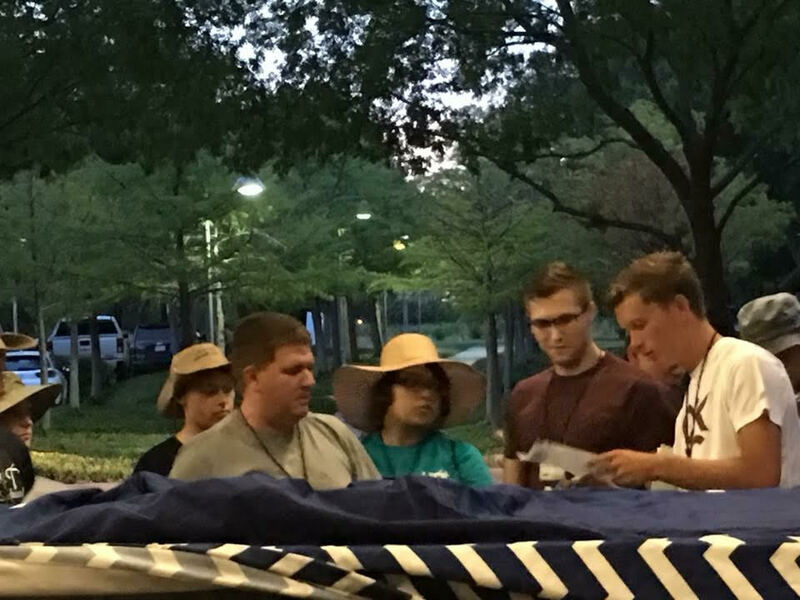 In July, Will Jones, our student leader, personally traveled to the Solar Car Challenge in Dallas, Texas. He acted as a judge during the “scrutineering” process and was able to look under the “hood” of every car at the competition. Of the experience he said, "It was incredible, I was able to ask tons of questions and make lots of connections. This was an invaluable experience to be able to participate in, and will undoubtedly make competing next year significantly easier." After attending the Solar Car Challenge, we had to go back to the drawing board. There were several things on our car that we had to redesign. Unfortunately, this meant totally stripping our car and sending it back to our welder in order for the modifications to be completed. Once again we would like to thank our welder, Stewart Woolard, for his continued support of our project and hours spent on our car. After getting the car back from the welder, we quickly went to work rebuilding our car. A couple of weeks ago, we were able to drive the car out of the shop which was an extremely exciting moment. After that energizing first drive, we excitedly finished our panel mounts and wired in the charge controller. This is the device that takes the energy from the sun and regulates the power so it can properly charge our panels. Note: Thank you Midnite Solar for your generous discount!. The car, as it sits now, is a true “solar car”. Energy from the sun is captured by the panels and then put back into our batteries or directly into our motor. Although we still have a lot to be completed before our car is ready to race competitively our team is very excited. If you would like to see our car/team in the “wild” we will be driving in the OHS homecoming parade on the 28th of September and as well as participating in a “Clean Energy Day” at the Impression 5 Museum on the 22nd of September. 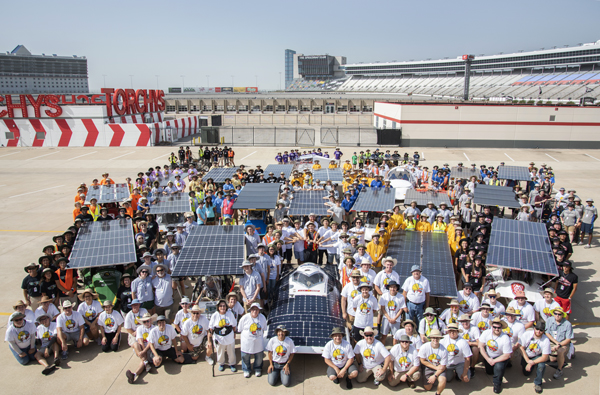 This week ended up being a busy week for the Solar Racing Club. On Tuesday we welcomed some new members to the team at our first meeting for the new school year. This Saturday, we drove some test miles and created a little video. We are very excited and looking forward to what this year brings. We would like to thank each and every one of you for your continued support of our team. 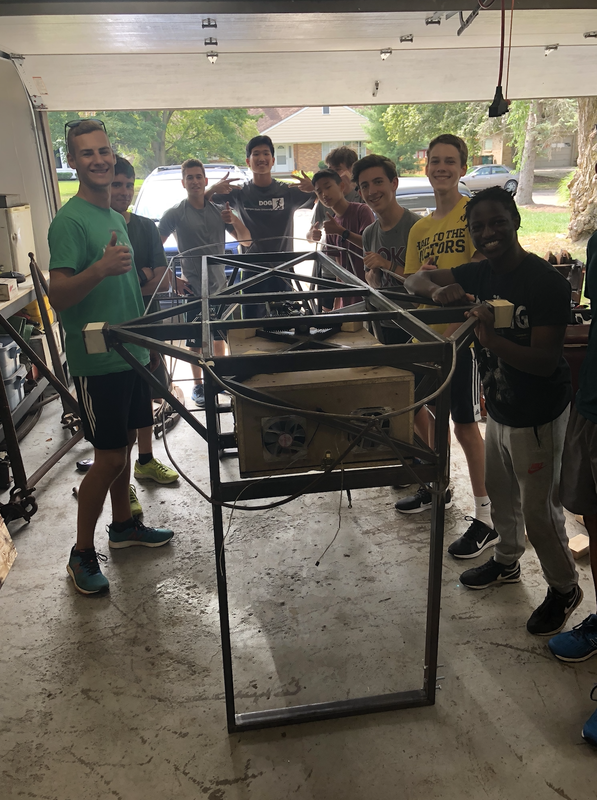 It is with great disappointment that the Okemos Solar Racing Club will not be able to compete in the 2018 Solar Car Challenge. Our vehicle will not be ready in time to properly compete. We have been working as hard as we possibly can the past few months in order to prepare our vehicle. At this time the car is not “roadworthy.” At this point, we know we are rushing to compete and cutting many corners. Our vehicle needs to be safe, roadworthy, and have many miles under its tires in order to properly compete. In the time we have left until the competition begins in July, it is just not possible to safely compete. In spite of that we are still working on the solar car to make it as efficient as possible. 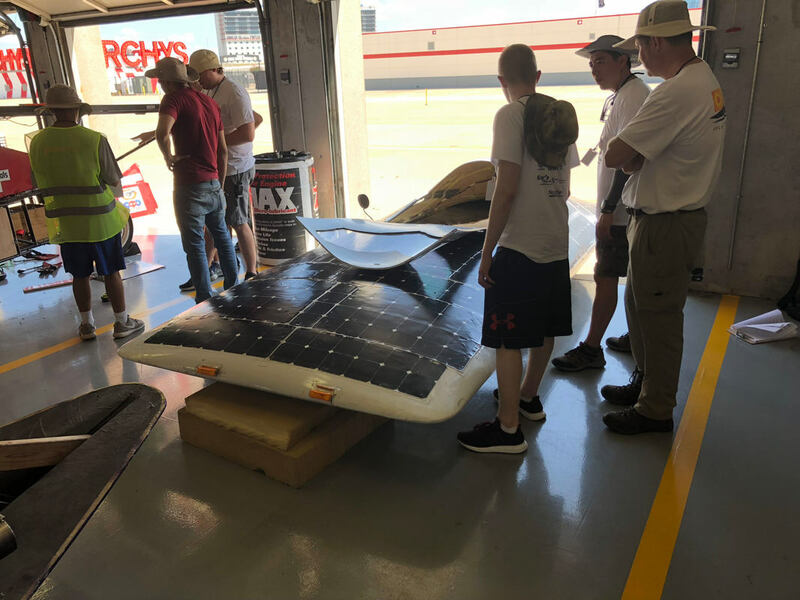 We are planning to race in the 2019 Solar Car Challenge. We are grateful for all of our sponsors and without them none of this would have been possible. Since our last update we have progressed a lot. We have attached a steering wheel, a seat, a battery box and battery, throttle, and back suspension. We are thrilled to be working throughout the summer till the upcoming school year. Have a great summer! 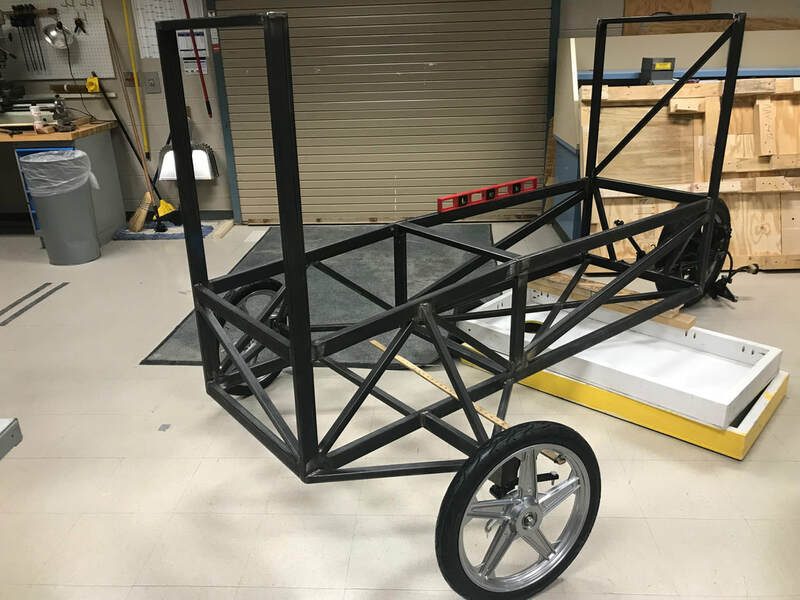 Since our last email we have made an incredible amount of progress on the construction of our solar car. We have purchased our motor, and now have almost all of the components we need to complete our car. Thank you to our sponsors for providing these necessary parts. We would like to thank AVL for their financial contributions, without AVL none of this would be possible. Thank you also to Complete Battery Source for donating our batteries. Will''s mom is extremely happy to have the batteries removed from her dining room. On the financial side we have been hard at work. We have secured food nights at local restaurants for the future and are still working on securing more food nights. Of course, we would accept any contributions. We have also continued to fundraise and work on the documentation necessary to race. On the mechanical side, we have continued to work on the car's frame. We have mounted the front wheels and are finalizing the design for the rear suspension mounts. A large thank you to the Holder Corporation for helping us machine the mounts for the front wheels. We have also worked on finalizing steering mounting points and finalizing our battery box. Lastly, we have received our motor and one of our teammates, Gal, has our motor spinning! Below, is a video of Gal firing the motor up. We hope to have a running and driving car after spring break. We are super-excited about the progress we have made and will keep you updated on our progress. In terms of fundraising we have reached out to teachers, businesses, and family members, accounting for most of the money we’ve made. So, thank you for all of your support! All of your participation and help has enabled us to purchase crucial parts, and do more fundraisers. So far, we have done two deposit can/bottle drives, a bake sale, collected scrap metal for the junkyard, and done two food-nights at local restaurants. Also we have a food-night at Chipotle next Tuesday. Hope to see you there! We have registered for the Solar Car Challenge this summer which we are very excited about. We attribute that to you, our sponsors! Also we have started the process of planning our trip and cannot wait to compete. We have ordered our motor and we’re glad to announce that we have our solar panels thanks to Mid-Michigan Solar King, our batteries thanks to Complete Battery Source, our rear suspension thanks to Slicks, and our front suspension and tires thanks to Buena Vista Surrey. Thank you to all our sponsors for your support! We have made good progress on the design of our car and have begun the building process. Shown below is the bare bones of our frame, our battery box, and our panels. We look forward to keeping you updated on the progress of our car and we will have much more news shortly!